Guests to RMG Exposed will be greeted by a special artist project by Katrina Jennifer Bedford in the RMG’s lobby space. SPIN is a site-specific, projection-based installation of an animated disco ball that utilizes traditional stop-motion animation techniques. Through this large scale installation Katrina Jennifer Bedford explores the concepts of motion and light. Each of these elements denotes distinctive qualities yet, when combined together produce a stunning sensory experience. This work was originally exhibited in Toronto’s Nuit Blanche in 2012. A limited edition artist print of the project will be available for $50 in support of the RMG’s community outreach programs. The 8×12″ fine art prints are printed with archival ink on 100% cotton Hahnemïhle photo rag. Please visit rmgexposed.ca to purchase in advance. The artist and the RMG thank Durham College, Ed Video and Posterjack for their support of this project. Image: Katrina Jennifer Bedford, SPIN, (detail), 2012. Courtesy of the artist. 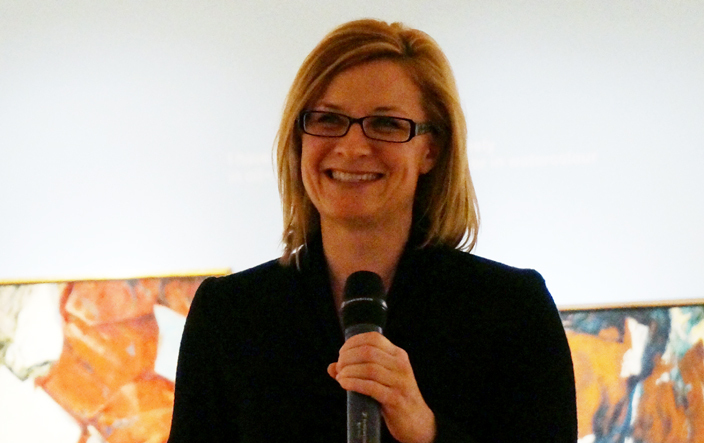 This month at the RMG, we are unveiling a new exhibit where the art will speak to you. Literally. Popularized by the likes of the legendary Kermit and Miss Piggy from the gabbling crew, The Muppets, puppets have been a popular form of entertainment throughout history. This personification of an object dates back to Ancient Greece in 5th century BC where the oldest written documentation of puppets is in the works of historians Herodotus and Xenophon. Puppetry ranges from different types of mediums and are used as a source of entertainment and education all around the world including the Bunraku puppet from Osaka, Japan (1684) to the common finger puppet style used today by children and adults everywhere. Cantastoria, or puppet storytelling, is the theme of the latest exhibit at the RMG curated by Linda Jansma. Puppet Act: Manipulating the Voice features marionettes from the Peterborough Museum & Archives collection whose historic puppets, retired from the Peterborough Puppet Guild, present as disturbing caricatures waiting to come to life once more. The exhibition, set to open May 23, also includes contemporary work from six artists. These puppeteers convey humanistic motifs of fear, manipulation, irony, humour and the battle between good and evil. 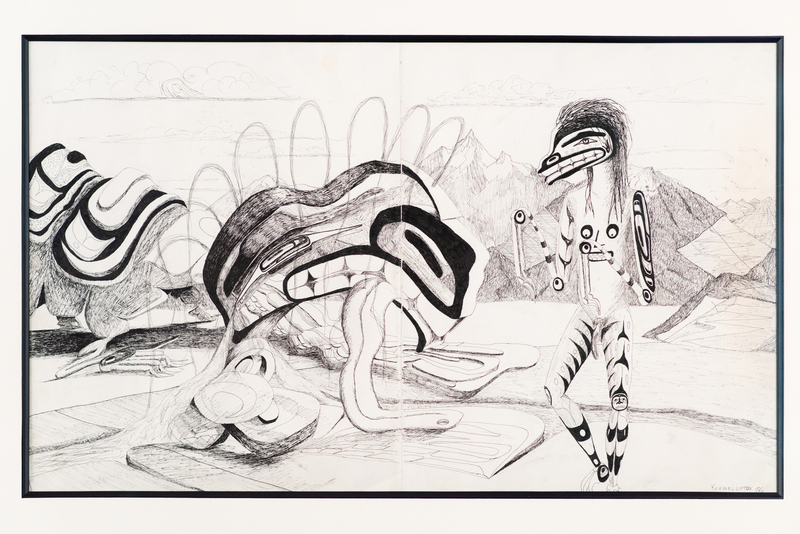 Among this work is a drawing by Coast Salish artist Lawrence Paul Yuxweluptun, graduate of the Emily Carr School of Art and Design. Threaded in his work are personal experiences and powerful socio-political messages used to document and promote change in Indigenous communities. Yuxweluptun sheds light on the diminution of the culture’s land and rights emulated through Native masks and imagery depicting environmental degradation. Lawrence Paul Yuxweluptun. Untitled, 1996. Ink and graphite on paper. Diana Lopez Soto is a performance artist based in Uxbridge, Ontario. In Puppet Act, she uses sheep-headed dancers to portray the relationship between man and animal. Lopez Soto’s performance catalyzes on human experimentation in animal cloning and the use of human genes to develop sheep that produce clotting protein in its milk. Despite the lack of Chuckie-esque puppets in this exhibit, there are metaphors treading on the darker side riddled within the subjects they convey. “Taken together, the work in this exhibition strives through the inanimate, to ignite discussions that help reflect who we, the animate, are,” says Jansma. Toronto-based Suzy Lake was one of a pioneering group of artists in the ‘70s to implement performance, video and photography as a means of human expression. For Puppet Act, Lake personifies herself as the marionette in her mid-1970s performance piece depicting powerlessness. Infused in her work is politics of gender, the body and identity. Spring Hurlbut is another artist who articulates social presence throughout her work. 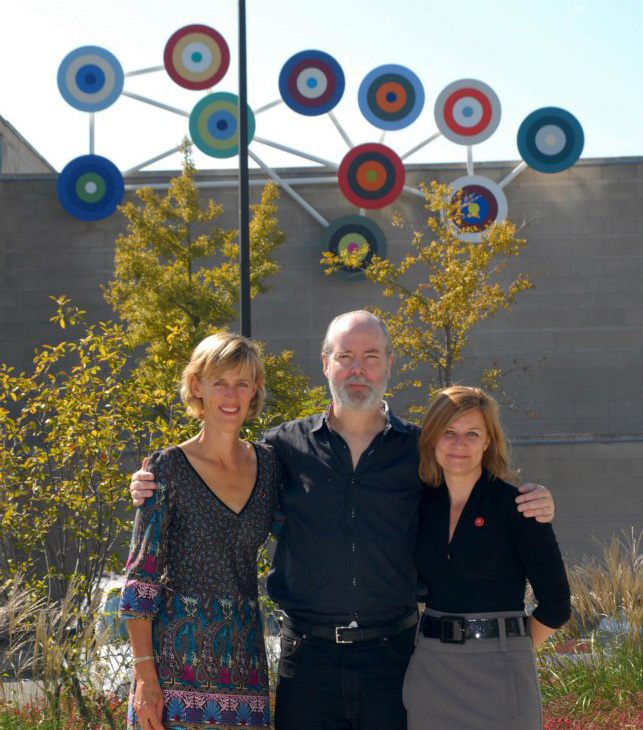 Born in Toronto, Hurlbut studied at the Ontario College of Art and Design, the Nova Scotia College of Art and Design and in 1988 completed a Canadian Council-awarded residency in Barcelona to study architecture. In this exhibit, Hutlbut emulates the human condition through vintage ventriloquist dummies. Catherine Heard’s skeleton sculptures dance to the artist’s fascination with the “strangeness of the monstrous form”. Including scenes of torture and rural history, the fabric curtain made from a mixture of antique redwork embroidery and “fake” redwork imitates the style of the antiques. Like Heard, Tim Whiten, born in Michigan and resides in Toronto, is a sculptor who expresses both the sacred and the profane within his work. 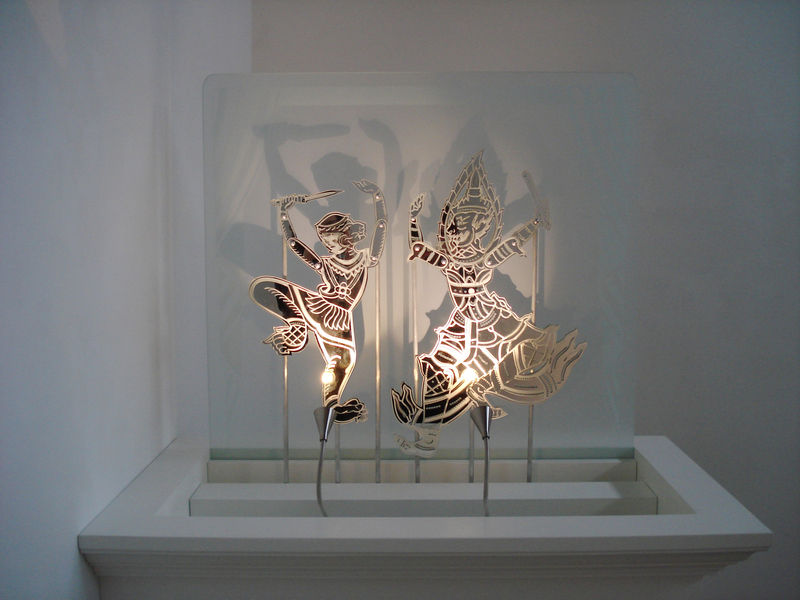 His glass sculpture Saga-Ra-M references the human experience of reality using puppets and their shadows. Tim Whiten, Saga-Ra-M, 2013. Handcrafted crystal clear glass, sandblasted mirror, aluminum rods, stainless steel LED lamps, MDF plinth. Puppet Act: Manipulating the Voice is on May 23 until September 1 with a reception and Artist Talk on Sunday June 7. Come see the exhibit sure to get mouths moving. Image at top: Spring Hurlbut, Dizzy, 2009-2010, installation of nine vintage amateur ventriloquist dummies circa 1930-1950. Photo by Toni Hafkenscheid. This post is by Heather Bulman, a public relations student at Durham College and the RMG’s current Communications Intern. Toni Hamel was drawn to art very early in life. She remembers creating her first sculptures from the clay brought up from the ground after her parents added a well to the backyard of their Italian home. To this day, Hamel keeps the earliest evidence of her true passion – a photograph from kindergarten with a few drawings on the back. In Italy, Hamel fought to pursue an education in the arts. Finally, in 1983, she graduated with a bachelor’s degree from the Academy of Fine Art in Lecce. However, after moving to Canada, she found it difficult to find a job with a degree in fine arts. Hamel took advantage of the dawn of technology by studying computer graphics at Sheridan College. As one of the few women working in technology at the time, she went on to have a very successful career as an interactive media developer and instructor at the University of Toronto. Despite her successes, Hamel grew tired of her career and, with the support of her husband, decided to return to her true passion. Since 2007, she has focused her creative efforts solely on her art. Although she incorporates many mediums into her pieces, she works mostly with graphite. 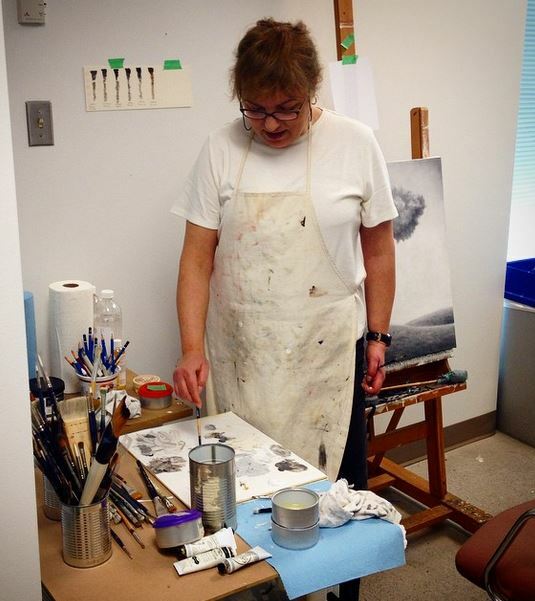 Beginning February 4, she will have the opportunity to create new content as the second artist in residency at the Robert McLaughlin Gallery (RMG) in Oshawa, Ont. In the galley’s Art Lab, attached to the recently opened Gallery A, Hamel will have the space to reflect on humans’ relationship with the environment in her new series, The land of Id. This subject matter will complement a current exhibition in the RMG, Running on Empty, while exploring different formats. Hamel’s experiences in Italy have inspired her to explore powerful topics such as social and political issues. She believes artists have a responsibility to raise awareness about important topics and share their experiences. For this artist, it’s all about sharing a message. Hamel often uses humour and satire to explore controversial topics. While she admits that reality can be offensive sometimes, she also finds it challenging to find the right balance. As her work has evolved, Hamel has learned that sometimes she can say more with a whisper than a shout. Toni Hamel’s exhibition The land of Id runs in Gallery A from March 3 to 29. Image by Toni Hamel.